New Parker Grain Carts with Lightning-Fast Unloading - Unverferth Mfg. A new lineup of Parker lightning-fast-unloading grain carts debuts with the 42-series corner-auger models. They feature larger-diameter augers for greater unloading speed and a longer auger design for greater unloading height and reach. Models 742, 842, 1042 and 1142 feature capacities of 750, 850, 1,000 and 1,100 bushels respectively with up to 500 bushels per minute unloading speed. 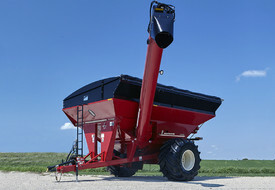 The patented soft-start, single-point auger engagement and 7/16”-thick computer-balanced continuous-flow flighting design ensure a smooth transition between the upper and lower augers for added durability and unloading speed. There’s also a deep sump for maximizing grain throughput and cleanout. A two-way downspout provides fore/aft hydraulic unloading control for easily topping off the truck and an auger-mounted LED light facilitates nighttime unloading. Standard features include a wheel-operated cleanout door and choice of high-quality red or green baked-on finish with silicone-sealed seams for an automotive-style finish. A transport chain and LED amber and red lights and reflective striping are included for safer road transport. A wide variety of undercarriage options are available, depending on model. All models can be equipped with high-flotation singles. Straddle-row duals are available on 750- to 1,000-bushel models. Several track options are available for 850-bushel and larger models that provide maximum flotation, including the patented Equalizer® design with 42”-wide belt and front/rear and left/right pivoting for optimum flotation on model 1142. Weighing options include traditional scales with basic, easy-to-use weighing features or an enhanced 26-character LED display for added data tracking features. Also available is the company’s exclusive UHarvest® data system for detailed harvest tracking such as grower, farm, field and truck via ISObus and/or mobile device. The UHarvest Lite ISObus system allows the user to track grower, farm and field data using the tractor’s monitor. For additional information, growers are encouraged to check with their nearest Unverferth dealer or visit parkerequip.com for complete details.